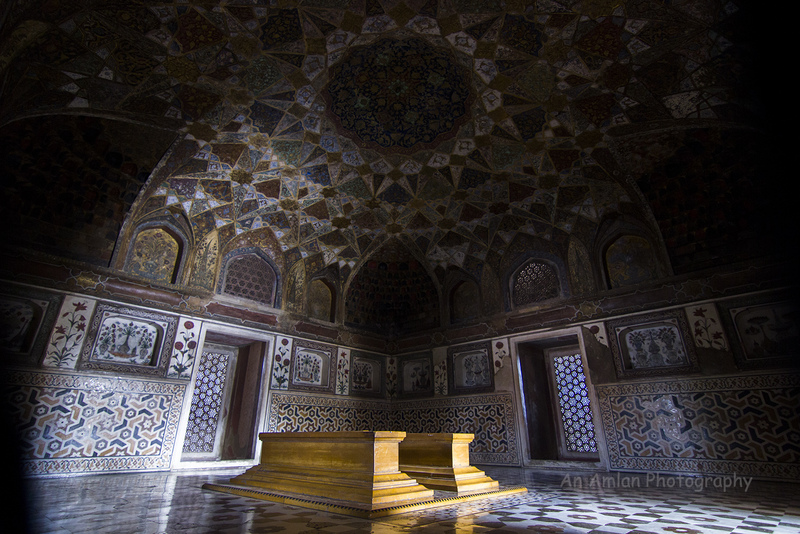 Walking along the history of Mughal Era, we find a sharp declination between the monarchy of Akbar and Shah Jahan. The fourth Mughal King Jahangir, preceded by the Akbar the Great and succeeded by Shah could not justify the crown. Even this era did not gift any big monument like his father and son. Actually Jahangir was not so fond of architecture. 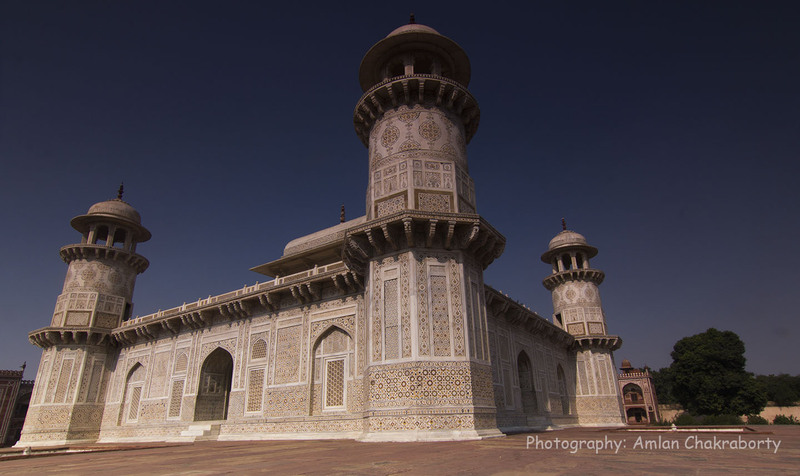 He only completed Sikandra, the mausoleum of Akbar but the planning and patronage of Sikandra was done by Akbar himself. But His wife, Begum Nur Jahan, who took an important role in Mughal Darbar, built the only remarkable architecture in this time – Idmad Ud Doula. Architects say that Jahangir could not understand the concept of the minarets that was Akbar’s approach. Nur Jahan got it clearly and set up his father’s tomb with the minarets and later, the structure was followed by Shah Jahan in Taj Mahal. So, from architectural point of view Idmad Ud Doulah can be said as the precursor of Taj Mahal also the use of marble started from here. Mirza Ghiyas Beg, a Persian Amir, was the father of Begum Nur Jahan. After She got married with the Mughal King Jahangir, Nur Jahan’s influence started getting prominent in “Mughal Darbar”. Mirza Ghiyas Beg gradually became an important person and got the title “Idmad-Ud-Doulla or Itimad-Ud-Doulla (pillar of the state). After his death, his daughter, the Mughal Begum, constructed this maussoleam. 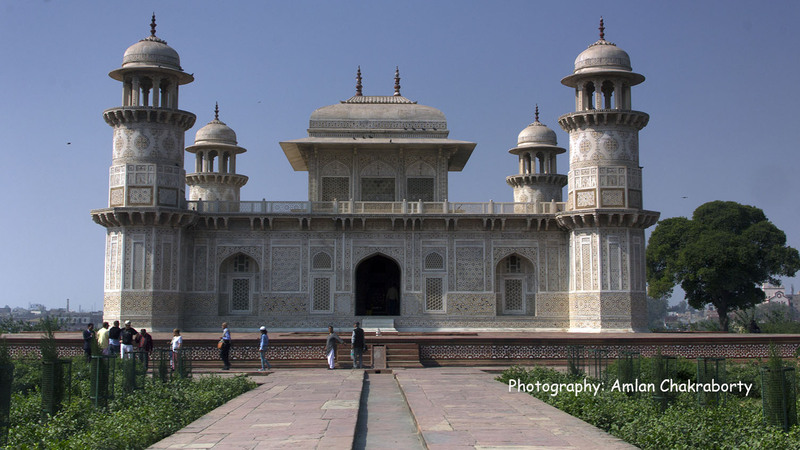 Located on the other bank of Agra Fort, Idmad ud doulla can be visited by car or local bus from Agra. The mausoleum is set in a “Charbag Complex” – large cruciform garden criss-crossed by water courses and walkways. The main structure itself covers about twenty-three meters square, and is built on a base about fifty meters square and about one meter high. Midpoint of each corners contain a hexagonal towers. The walls are made up from white marble from Rajasthan encrusted with semi-precious stone decorations – cornelian, jasper, lapis lazuli, onyx, and topaz formed into images of cypress trees and wine bottles, or more elaborate decorations like cut fruit or vases containing bouquets. Light penetrates to the interior through delicate jālī screens of intricately carved white marble. The interior decoration is considered by many to have inspired that of the Taj Mahal. The architectures built during Akbar’s regime was made up by yellow or red sandstone. But we can see a sharp deviation during Shah Jahan’s architectures where the use of Marbel is main (except Lal Qilla and Jama Masjid of Delhi). Now we can say Tomb of Idmad ud Doulla can be the beginning of Marbled Architecture in Indo Islamic Architecture. This is one of your best write up..